The 701927 is a 50:1 or 500:1 high voltage (1400V peak) probe with extended bandwidth covering DC to 150MHz, This probe provides a balanced differential input, to be used with oscilloscopes with single-ended inputs (1 MΩ Input Impedance). This probe works with DLM2000, DLM4000, DL6000, DLM6000, DL9000 and SB5000. This probe is conveniently powered by the Yokogawa Probe Interface I/F. 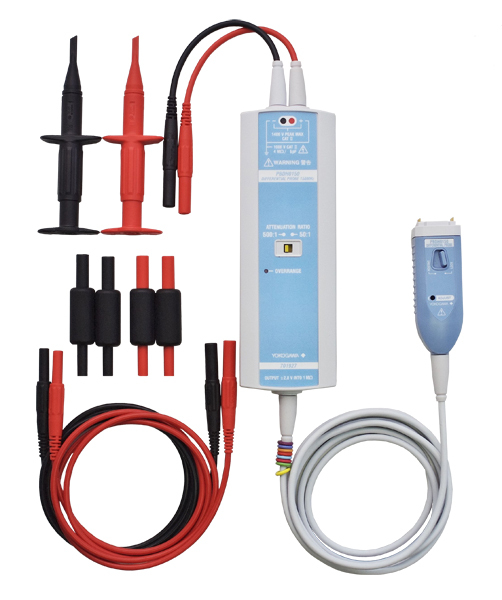 1400 Vpeak capability is suitable for un-grounded and floating voltage measurements in power electronics and mechatronics applications including inverters, motor drives, and power supplies. 1 m long extension lead pair is included as a standard accessory. Standard pincher tips are exchangeable a wide variety of 4mm safety adapters (sold separately). Reduced size and weight over comparable probes (50% reduced volume over the Yokogawa 700924).